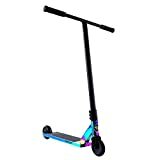 Why should you purchase a trick scooter? If you have mastered riding on a scooter and want to start performing all sorts of stunts and tricks, you'll need something more advanced. Today’s market is filled with several types of trick scooters that skilled users regard as exceptional. You can buy an exceptional trick scooter from various e-commerce websites, once you are equipped with our expert tips. 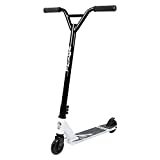 What should you consider when buying a trick scooter? Go for flexible brakes: Look for scooters that have flexible brakes. They are non-spring brakes, which help the rider flip comfortably while doing stunts. Ensure the scooter has grip tape: Buy products which have grip tape on the deck. That will keep you from slipping off the deck. (There are also special handlebar grips, for better control.) This is another crucial factor to check, so as to avoid accidents. Choose a non-folding scooter: Scooters that come with a folding mechanism are basically ordinary scooters. 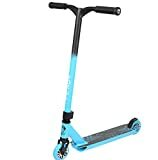 You should prefer non-folding scooters--those are the ones which are treated as trick scooters and are more capable of performing trick moves. Avoid adjustable handlebars: Choose trick scooters which do not have an adjustable handlebar. A non-adjustable handlebar is for stunt scooters so that they remain fixed while doing stunts. Select a strong deck: Look for a steel or aluminum deck that can tolerate extra pressure. 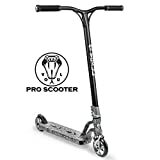 Look for an effective compression system: Choose trick scooters with compression systems, which help keep the deck, bars, and headset at the right tension. 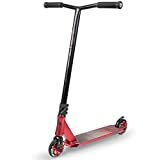 Now that you know what to check for before buying a trick scooter, purchase one with the right specifications that will fit your budget as well.